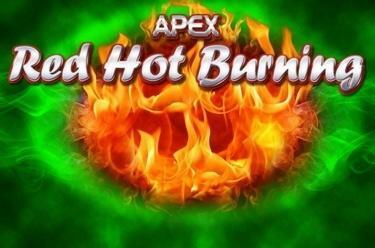 Play Red Hot Burning online for free now! Fan the flames with Red Hot Burning. Spin the reels of this classic slot featuring six fruity symbols, the red 7 and a golden Bell and land fiery winnings. A Wild Shamrock, Scatter Star and Scatter Dollar Sign crank up the heat even further! Your am at Red Hot Burning is to fan the flames by landing five matching symbols on one of the five win lines. Your winning combos must run from left to right. Put a little green in your winning fruit salad! The Wild Shamrock can only appear on reels two, three and four, and can substitute for all other symbols except for the two Scatters. It also expands to cover all of the positions on the reel when it appears. What does that mean? If the Wild Shamrock lines up with an existing symbol combination, with a little luck you could win even more! Red Hot Burning features two Scatter symbols that will get the Twists flowing irrespective of the course of the win lines. The Scatter Star wins with three matching symbols in any position on reels one, three and five. The Scatter Dollar Sign wins as soon as you land three, four or five matching symbols in a single spin. 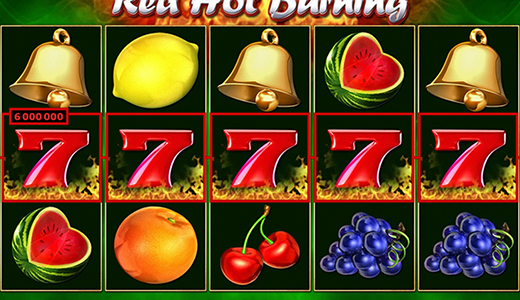 If you love your fruits and winnings served hot, Red Hot Burning is the slot for you. Six fruit symbols, a red 7, a Bell, a Wild Shamrock and two different Scatter symbols fire up the five reels of this classic game. So, all that’s left for you to do is fan the flames and get matching symbols along the five win lines! Is this slot too hot for you to handle? Time to find out! This fruit slot delivers what it promises: sheer entertainment!